Creator explains protracted dev time in wry post-mortem. 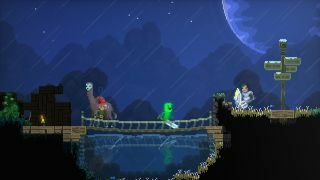 Procedurally generated Terraria-like MoonQuest has launched in Steam Early Access, after a whopping seven years in development. The game looks like familiar survival and crafting fare set in a bizarre alien world. Players mine the game’s environment for both resources and adventures, building structures and crafting new equipment to sustain themselves in a world populated by hopping spiders and weird long-necked horse-things (NOT giraffes, I know what they look like). You can also wield environmental hazards like fire and lava to your advantage. What’s fascinating about MoonQuest’s launch is the length of time it has taken to produce. Its Melbourne-based creator, Ben Porter, quit his postgraduate job way back in 2011 to build the game, which at the time was known as Moonman. It makes for an interesting insight into how time consuming game development can be, especially if you don’t prepare yourself in the correct ways. MoonQuest is available now for £9.29 on Steam. You can see its curious world in action below.